The Powder Alliance (www.PowderAlliance.com) is proud to announce the 2014/15 Wild West Powder Quest, a visit-based sweepstakes designed to get skiers and snowboarders exploring their world and discovering the best powder stashes on the West Coast. 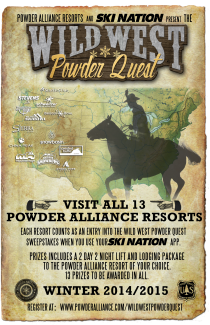 Any participant who visits a Powder Alliance resort prior to April 30th, 2015, and tracks it with their Ski Nation app will receive an entry into the Wild West Powder Quest Sweepstakes. Thirteen lucky winners will receive a 2 day, 2 night lift & lodging package for two (2) to the Powder Alliance resort of their choice valid during 2015/16 winter season, non-holiday. The more resorts a participant visits, the better their chances of winning. 2) Download the Ski Nation app http://www.skination.com/ for iPhone or Android create a profile matching their Wild West Powder Quest registration. IE Same name, email, etc. 3) Visit as many Powder Alliance Resorts as possible during the 2014/15 season. These include Angel Fire, NM, Arizona Snowbowl, AZ, Bridger Bowl, MT, China Peak, CA, Crested Butte, CO, Mountain High, CA, Mt Hood Ski Bowl, OR, Schweitzer, ID, Sierra At Tahoe, CA, Silver Star, BC Canada, Snowbasin, UT, Stevens Pass, WA, and Timberline, OR. For every resort visited, the Ski Nation App will award a digital badge. Each badge counts as an entry into the 14/15 Wild West Powder Quest Sweepstakes. The more Powder Alliance resorts the skier visits, the better their odds of winning. Limit 13 entries per person. The Wild West Powder Quest is open to legal residents of the 50 United States, including the District of Columbia, ages 18 and over, and Canada, ages 19 and over. Click here for official rules and regulations. Thirteen (13) prize winners will be chosen in all. Winners receive a 2 day, 2 night Lift & Lodging package to the Powder Alliance resort of their choice valid during the 2015/16 winter season, non-holiday. One Lift & Lodging Package is available from each resort. First come, first served. Limit one prize per participant. Winners will be chosen by random drawing and announced on May 15th, 2015. Explore 3,000 acres at Snowbasin Resort in Utah. Dive deep into 400 inches of fresh snow annually at Stevens Pass, WA, or enjoy ski in ski out accommodations at our newest member, Silver Star, Canada. Thirteen premier North American resorts make it easy to create your own Powder Quest with memories that will last a lifetime. So grab your gear and start hitting the slopes. How fast can you visit all 13 Powder Alliance areas in the Wild West Powder Quest? Don’t forget to tag your journey with #powderquest15. To learn more about the Powder Alliance and the Wild West Powder Quest visit www.powderalliance.com or contact John McColly at 760-316-7803 or john@mthigh.com.